We invite you to explore India - the Land with infinite beauty ! Whether you soar high into Himalayas or peer under the ruins of the Ancient monuments dotting the landscape of India, you will cherish the experience long after your visit ! This India Travel Guide on Alchi Chos-kor is free from any commercial interest! This site is dedicated to promote India - the vast subcontinent, its glorious past, magnificent landscape and its infinite variety. Amidst the barren mountains and in the valley of river Indus lies Alchi, about 65 kms from Leh, believed to have been patronized by rich Buddhist monks, several thousands of years ago. Kalden Sherap and Tshultrin are the Buddhist monks associated with Alchi, although it was founded by Rin-chen-Zang-po. Alchi was a fertile plain and agricultural land. The Alchi region received cultural influence from other parts of the world because of its strategic location. Alchi contacted Buddhism, Islam and Hinduism and Alchi's isolation helped retain its distinct culture and tradition. Alchi rests on the main trade route to Central Asia, a route along the Indus via Leh, and connected to Chinese Turkestan. There are remarkable murals in the shrines and stucco images which historians date to a period between 11 and 13 century AD. Alchi is typically a small village that is situated on the left bank of the Indus, about 70 km from Leh, on the Leh Srinagar highway. Alchi choskor is a religious enclave that is situated on the village, in the plain. About a hundred years ago, this Alchi cluster was taken over by Lekir which cared and maintained the enclaves. Although religious sentiments attract tourists to Alchi, this place draws more attention for its art and architecture. 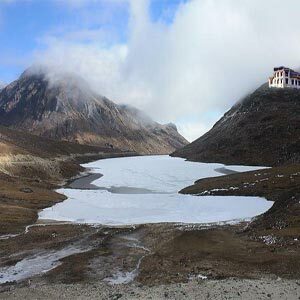 Alchi enclaves can be divided into three main parts, the Gonpa, a temple for Padmasambhava and another main one for Alchi choskor, which is situated at a close distance but is entirely different in style. Gonpa has a local lama head. Many of the old paintings seem to have been lost but still some good works of art exist. The Padmasambhava temple is dedicated, as the very name indicates to Padmasambhava. Stag-Iha or the tiger god and Sengge Donga, the lion headed goddess, flank his either sides. A mural of Vajradhara, along with other manifestations of Buddha, can be found in the walls behind the statue. The monks from Chemday manage this temple which belongs to Drugpa or Kargyupa order. Akhi Choskor is a complex found amidst the village that overhangs the Indus. A discerning tourist can glimpse the small temple and houses amidst natural foliage and trees around. Alchi is a rich treasure trove of some of the historic artifacts that Ladakh proudly proclaims. These temples described below contain some of the finest elements of Buddhist historic arts that are rare in the Buddhist world. The Dukhang is the Assembly hall that has inscriptions mentioning the name of the founder, Kaldan Shesrab (Tdz), though relatively small and has poor visibility. The Sum-Tsek has three temples, with front wooden pillars that showcase some exemplary wooden works. Images of Buddha are carved in a triangular framework, which can be seen in ancient monuments in Kashmir. Tdz takes credit as original western Himalayan architecture. The Sumtsek paintings depict a style that is original, not found elsewhere. The arabesques are awes inspiring. Alchi's Sumtseg paintings are several centuries old and it is interesting to observe paintings like Avalokiteshvara's robe and Tara's entourage which exhibit a strong Moghul influence. Lhakhang Soma, which belongs to 12-13th century, depicts a painting style that is exemplary and different. This is chorten and no Kashmiri or Persian influence is seen as in Sum Tsek. Lotsava Lhakhang which dates back to the same age as Lakhang Soma to 12-13th century has a stucco image of Sakyamuni and a smaller one of Rinchen Zangpo; on the right is Avalokiteshvara. Manjusiri Lhakhang which is adjacent to Lotsava Lhakhang has a fourfold image of Manjusiri. The Chortens, locally popular as ka-ka-ni are well preserved beautiful original paintings adorn the walls on the two sides. Alchi choskor is truly one of the wonders of the Buddhist world. The essence of Buddhist Kashmir and Buddhist India is revealed in Alchi choskor. Historian Tdz notes on dating of Alchi, that 'a 12th century date would not be impossible, and thus we have dated all earlier work noted in the Dukhang, on the walls and alcoves on the ground floor of the Sumtsek and in the entrance-chortens as 11-12th century. The Lotsava and the Manjusiri temples were probably early additions and may be sagely dated to the 12th century. The Lhakhang Soma was added later, as its name the 'new temple' suggests, but its iconography can scarcely suggest a date later than the 13th century. We consider that none of this earlier work has been touched through the centuries'. It goes to the credit of choskor that despite several loots and destruction and invasions, the Alchi has survived. Since last 500 years, there is no religion that is practiced in the Alchi monastery. Instead the surrounding Gompa village offers a friendly atmosphere to the tourists, with its restaurants, tea stalls and souvenir shops. Alchi monastery is now an excursion spot, excellent for visitors visiting Leh, with sufficient spare time. There are guest houses that operate in Alchi for visitors and accommodation can be booked in Leh. It would be good to plan an overnight stay nearby. Tent accommodations are available. And on your return from Leh, just past Saspol, there is this 18th century monastery with its giant golden Buddha rising out of the horizon against the craggy hills and dales - an unforgettable sight indeed! The nearest airport is located at Leh which is about 70 km from Alchi. Alchi is situated about 541 km from Manali and about 364 km from Srinagar. You can't spot the monastery from the Leh-Srinagar highway but it is located on a plain within the village unlike most other monasteries. Alchi is part of the villages of the Lower Ladakh region.